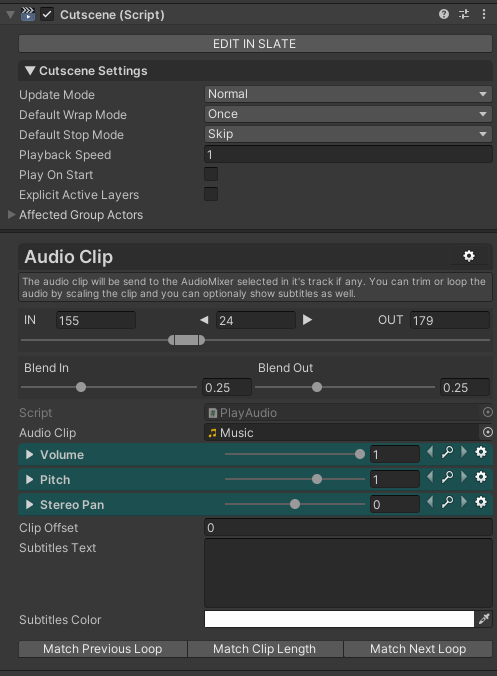 Simply put, you can control the cutscene’s playback from these buttons. Play, PlayReverse, Stop and Pause (when is playing). Play/Stop can also simply be done with the spacebar key. The list of cutscene Groups along with their Tracks underneath, are listed here. Right clicking on a Group or Track gives a relevant context menu for adding new tracks, deleting tracks or groups, replacing affecting actors etc. All of these will be explained in detail further down the documentation. One important thing to note though, is that there will always be a Director Group, which is impossible to remove (although it’s tracks can). Within the timebar section, you are able to change the view time and scrub the time by Click & Drag within it. On the right hand side the white carret specifies the end time of the cutscene (it’s length), which can simply be changed by Click & Drag the carret, or Control + Clik at a specific time point in the timebar. Everything that is beyond this carret and within the darkened area, will never be played. All track timelines along with their clips fall within this section, which is the main section you will mostly be working at. The selected element’s inspector (Group, Track or Clip), will display in the normal Unity inspector, inline with the cutscene’s inspector. For more information about the clip’s inspector specifically, please read the next section.